Since I was young I’ve been collecting insect specimens. Part of preparing the specimens for display involves spreading them out in the desired position, held in place with pins, until they dry/set in that position. Once they are set, they can be transferred to display/storage cases which are tightly sealed and contain camphor (a strong-smelling insect repellant) which helps keep them safe and in good condition. Whilst going through a box of old things in the attic, I found a cigar box in which I used to set specimens. However in the years since I had opened the box, all the specimens had disappeared. They had been eaten by dermestid beetles, a common pest in insect collections. 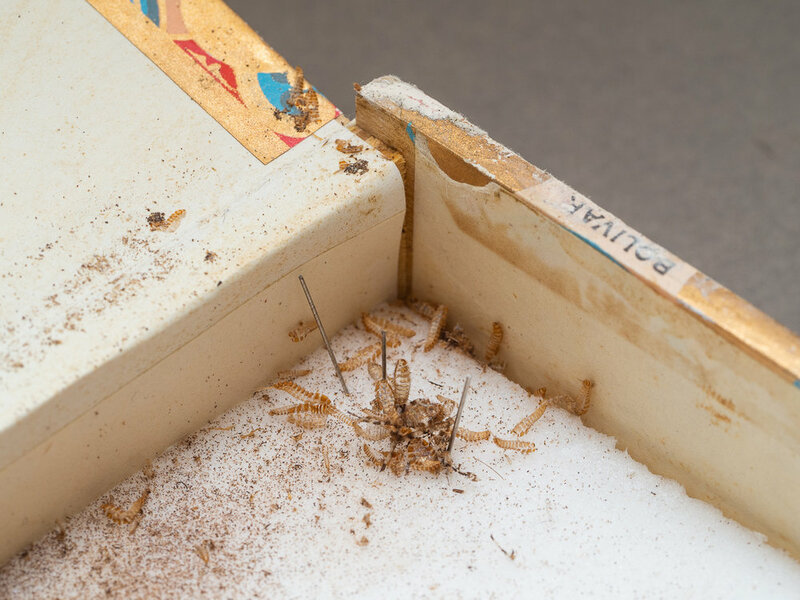 The box is now filled with the beetles’ exuviae and droppings, while the pinned insects are now just dust. Pinning insects is an attempt to press the Pause button right after death, to stave off decay and freeze an object in time. In this case nature has secretly pressed the Play button while I wasn’t looking.